Rising 40 storeys above the intersection of Adelaide Street and John Street, THE BOND is a soaring vision of translucent glass and steel with balconies and terraces punctuating its contemporary facade. An impressive podium Lobby, beautifully appointed with gleaming columns, lush plantings and art accents, welcomes visitors and residents. THE BOND offers a wide selection of one-, two- and three-bedroom suites and grand penthouses, designed and oriented for spectacular views and detailed with immaculate elegance. In the heart of the metropolis, surrounded by endless choices of entertainment options, lies your urban oasis within The Bond. Relax: under the sun or stars by the outdoor pool and hot tub, or on the magnificently landscaped terrace complete with an outdoor BBQ, private dining area and lounge. 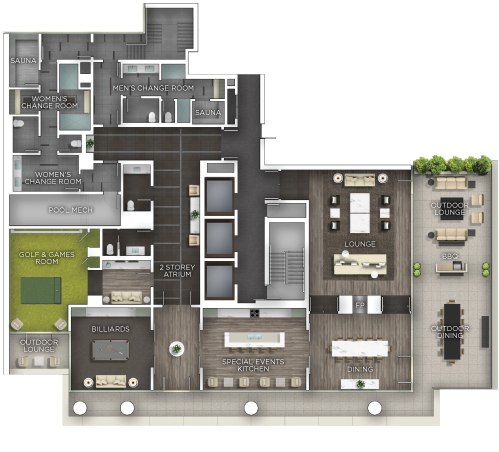 Revitalize: with the weight and cardio training room, double-height yoga studio and private change rooms with saunas. Retreat: to a private Residents’ Lounge with a wet bar, special event kitchen and private dining room with elegant double-sided fireplace for exclusive and private entertaining. Restore: your competitive juices by enjoying the Golf Simulator and Games Room with a golf projection screen and side-by-side plasmas, each with a game console, or a challenging game in the custom-designed Billiards Room.